CM inaugurated the first block of D D Mittal Towers. After that, he handed over 96 keys to the owners. 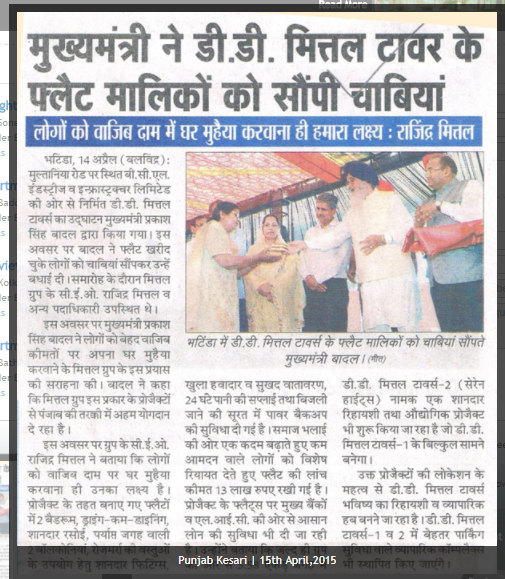 IN the occasion CM Mr. Prakash Singh Badal expressed that Mittal Family has contributed for Bathinda city and Country. Mittal’s are blessed since they provide shelter to the poor. There are poor people who can’t afford shelter. A lot of help has to be done for these people. He has seen the flats himself and found its reasonable in rates. CMD Sh. Rajinder Mittal welcomed CM. He told that D D Mittal Towers’ have 528 units in 11 blocks. The ground space shall be used as a parking area. From this area vegetable market, grain market, Adarsh School etc all are near. DGM Mr. Sandeep Tukral told that the flats are ready and discounts up-to 2 lacs will be given until 30th April as Baisakhi Offer. On this occasion CPM Mr. Saroop Chand Singla, Former MLA Mr. Paramjeet Kaur Gulshan, Mayor Mr. Balvanth Rai Nath and Former Mayor Mr. Baljit Singh Bid were present. CMD’s mother Sh. Ved Kumari, Brother Mr. Vinod Mittal, Wife Sh. Sunithi Mittal, Nephew Mr. Vitul Mittal, OSD Mr. Suresh Lubana, GM Col. J S Chowdary, etc were present.